Cannabis. Weed. Bud. Whatever you choose to call it, it's been a health aid, comfort, and life-enhancer for humankind for more than three thousand years. But while cannabis is used by hundreds of millions of people around the world, more than a century of prohibition has resulted in confusion about its status: Is it healthy? Is it medicinal? Will it make you crazy? 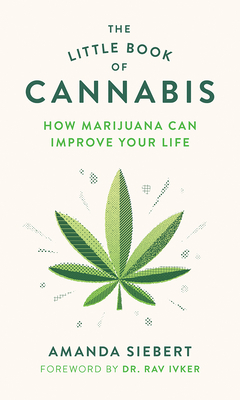 In this fun, illuminating book, cannabis journalist Amanda Siebert delves deep into the latest research to separate marijuana fact from fiction, revealing ten evidence-based ways this potent little plant can improve your life. She speaks with some of the world's top researchers, medical professionals, and consultants to answer questions such as: Can cannabis help you get a full night's sleep? Does it aid in exercise and weight loss? Can it really cure cancer? She also offers practical advice for maximizing its benefits--including easy-to-follow, step-by-step instructions for how to enjoy everything from joints to edibles, CBD oil to oral sprays--as well as examples of real people who have used cannabis to enhance their lives. This powerful plant, it turns out, could be life-changing: it can enrich any diet, slow down aging, and even spice things up in the bedroom. Based in Greater Vancouver, B.C., Amanda Siebert is an award-winning journalist and photographer best known for her work as the first-ever cannabis editor at the Georgia Straight. When she's not writing, making photographs, or indulging in the herb, she enjoys road trips, practicing Brazilian Jiu Jitsu, and taking her dog, Honey, to the beach.